The US Marines. The few and the proud. And what better icon than the Corps to infuse the ideologies of karate with? If you think about it, there are some striking similarities between Marine Corps life and certain aspects of karatedo: rank, title, warfare, elitism, etc.. It's ironic that the island that was so ravaged during the Pacific War (about half of Okinawa's population was wiped out) would later have its inhabitants teach the hitherto secrets of karate to the very forces that nearly destroyed them only a decade earlier. It took three months for the Allied powers to capture the tiny Okinawa in 1945, an island barely the size of two US counties. By the 1950s some of her indigenous karate masters began instructing American military in the art of self defense. At this point, karate was just a word. There was also a great deal of mystery and cynicism at the time regarding Asians, and in particular, the martial arts. When one young recruit wrote home to tell his fiancee that he was taking karate as part of his military hitch on Okinawa, his girl freaked. "Stop taking that stuff, it'll turn you into a killer!" The time was right for Okinawans to teach karate to US troops. The mid-to-late 50s was a period of rare peace in American history. The martial ways tend to thrive during peacetime in many cultures because of its philosophical core values. American boys growing up during the 40s listened with rapt awe and admiration to the great battles that were waged for the sake of global freedom and justice. World War II was strongly depicted as the epic fight of good vs. evil. War is full of glamor and romance to the dreamy macho neophyte. So what is a young recruit to do during otherwise boring and unglamorous peacetime? Enter the martial arts. Tatsuo Shimabuku was one of a handful of karate instructors contracted by the US government to teach Marines stationed on Okinawa. Okinawan sensei, most of them diminutive in stature, must have had their work cut out for them when they first started instructing these young bucks. At 5'2, 125 pounds, Shimabuku was hardly an imposing physical presence to the average 18 - 21 year old American Marine. More than once, karate's effectiveness was put to the test because some jarhead thought he could one-up the master. For Shimabuku, many techniques had to be instantly adjusted and modified to work with trainees that were nearly a foot taller than himself. All in a day's work, as he was compensated for his services with three-hundred American dollars per month starting in 1955. One could only imagine how that figure would translate into today's economy. Teaching karate to the Marines - not a bad gig for the retired farmer who survived one of the bloodiest battles in history. Have you read Sensei Hayes' book yet? He got his start in the martial arts while stationed in Okinawa too. Thanks, I figured you might like a Marine post. No I haven't. Last time I heard the next edition already came out. I'll have to email him again and see. 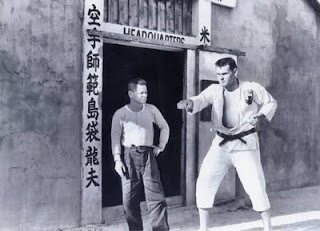 FYI Sensei Hayes' teacher was the younger brother of the founder of my style. Thanks, anon. That's a cool link. I'm sure some of my readers will get a kick out of it. You make a good connection between the marines and karate. Interestingly, it was the Japanese and westerners who imposed a lot of the pomp, rank, elitism, etc into karate, instead of gleaning those things from it. The original instructors of karate were simple farmers who taught a handful of capable students; no real colored belts or hierarchies involved. These days, that japanese/western influence has ebbed back into Okinawa and we see ranking, etc there too. The effecters have indeed become effected. Very nice post Vesia Sensei.